On Wednesday, April 17, 2:00 – 3:00 PM EDT, Rita Deedrick (Director, COSI Center for Research and Evaluation) and I will lead a webinar for the Association of Children’s Museums, Museums in Service to Young Multilingual Learners: Findings from an Exploratory Project. 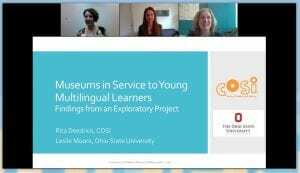 We will share key findings from our NSF-funded project that sought to lay the groundwork for improving informal science learning experiences for preschool dual language learners (DLLs). ACM members are invited to join us to hear about what was learned from the project and how the findings may inform future practice and research. Posted in grants, informal science learning, multilingual	Bookmark the permalink.